Today is a play day. Today I’m going visiting. Today I’m not playing the part of hostess. Today I am playing the part of guest! Today it’s my friend Andy who is playing the part of host. He’s invited me to tea. Andy has also invited my friend Evelyna to tea. When was the last time you were invited to tea? When you give, good things come back to you. If you entertain now and then, chances are, from time to time you will be entertained as well. It’s another beautiful day in my neighborhood, a grand day to go visiting, but then any day is a grand day for friendship and visiting. Evelyna and I arrive at Andy’s house and we are greeted by a glorious apple tree bursting with color. It is apple blossom time you know! 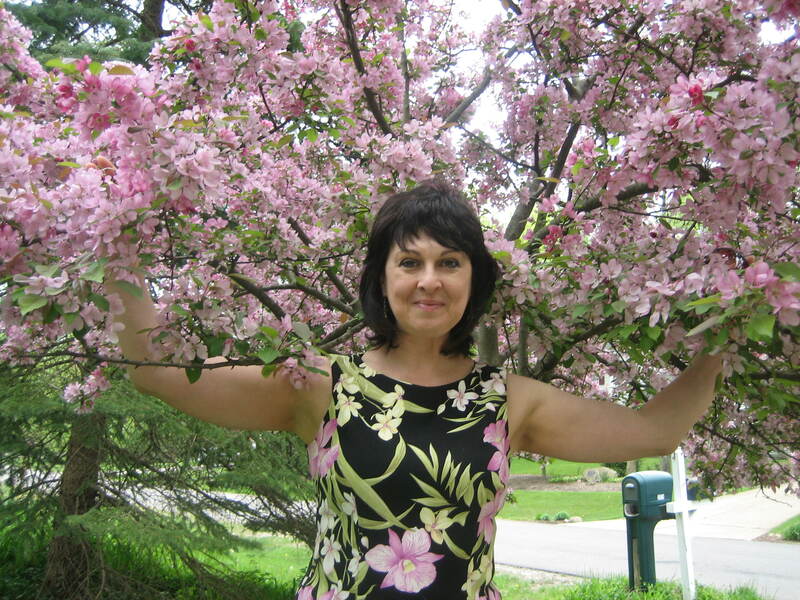 Evelyna is so delighted with this tree she runs up to it and caresses its blossoms I can’t blame her. I want to do the same thing. The beauty of nature is all around us here in Andy’s yard. 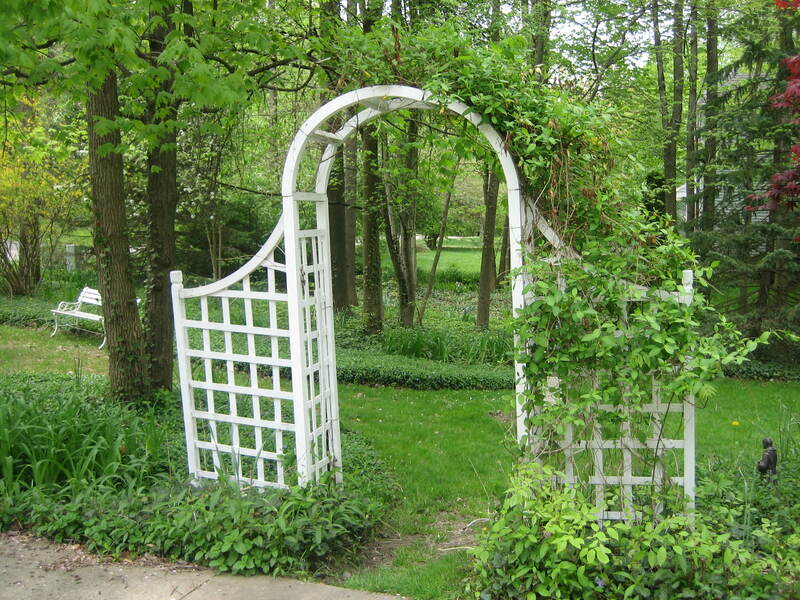 There are all sorts of romantic, old fashioned garden structures at every turn. They enchant us. 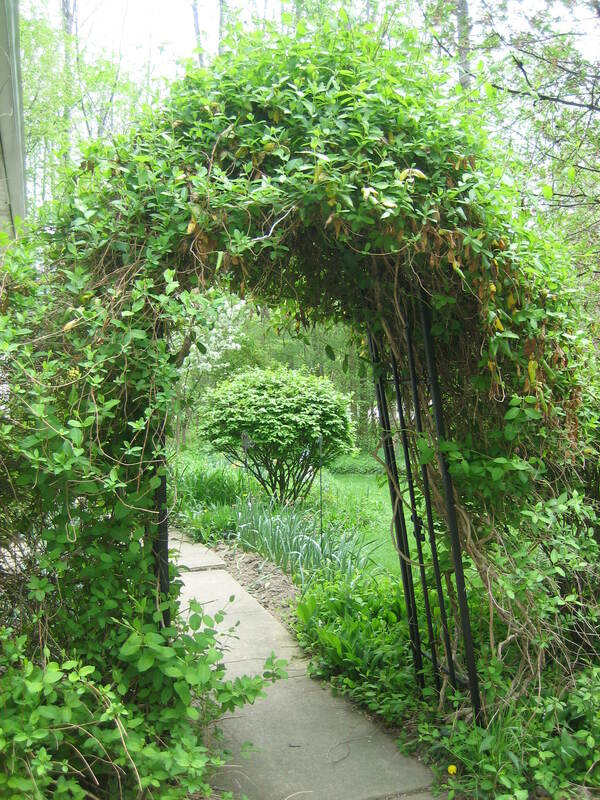 We approach the wisteria-covered arbor and slowly make our way to the door , all the while admiring the beauty of nature on this lovely Spring day. 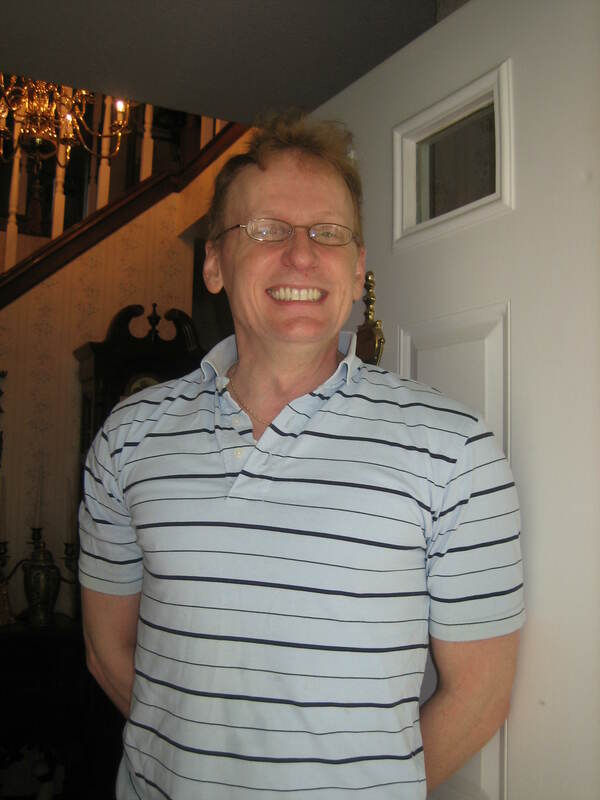 Andy appears – all smiles. “We’re here”, we say. “And we’re bearing hostess gifts. Evelyna brought one of her famous pumpkins rolls and I brought Andy one of my favorite books of spiritual meditation. 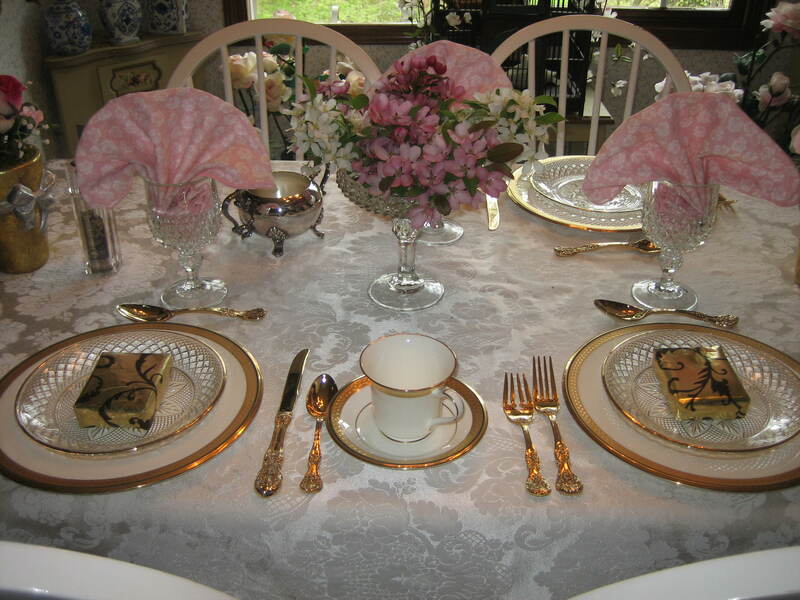 and then it’s off to the tea table which is set beautifully just for our pleasure. How wonderful! 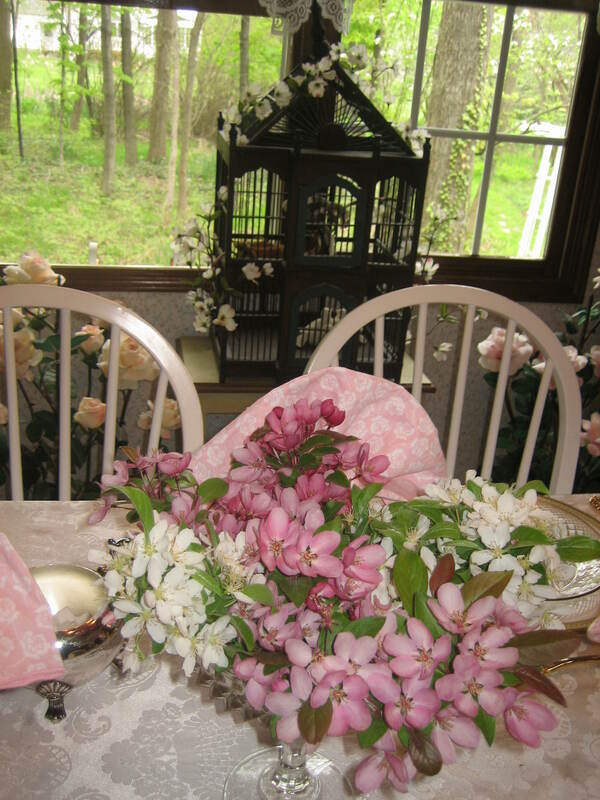 More fresh apple blossoms grace the table and Andy has set little boxes of chocolates at our plates. They serve as sweet favors. 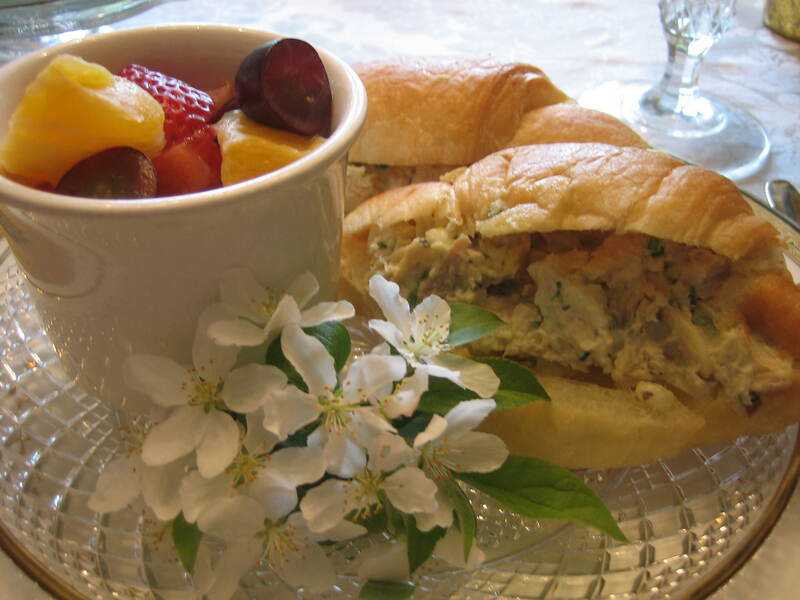 Lunch is simple, but delicious – chicken salad croissants accompanied by fresh fruit. Andy even decorated our plates with apple blossoms. What a guy! 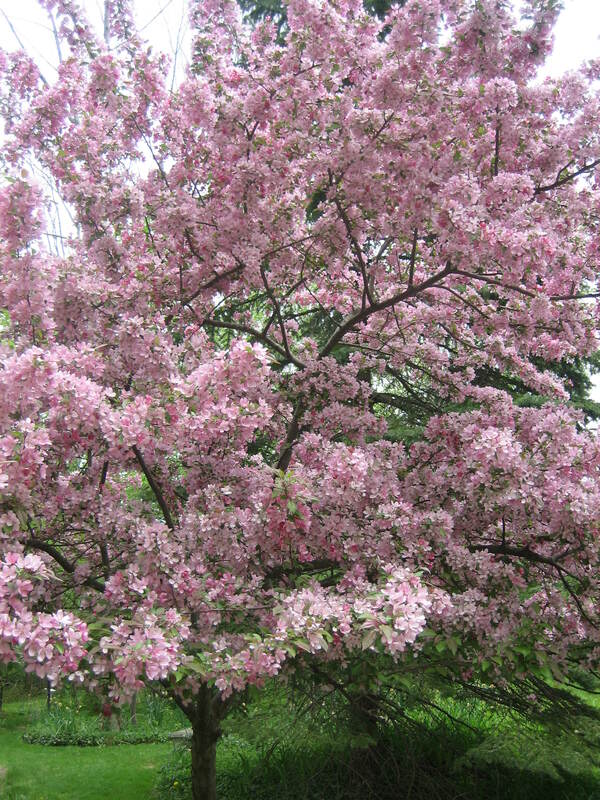 When it’s apple blossom time we should all take advantage of the splendor and bring those blossoms in to be enjoyed up close. That’s true of all the lovely flowers blooming in our Springtime gardens – lilacs, lily of the valley… Everything! The ice water on our table was garnished with orange slices and the tea was cherry flavored. There was also a delicious broccoli soup. It’s nice to have friends who are master bakers… masters at anything, especially if they share their mastery with their friends. Evelyna brought us two goodies. 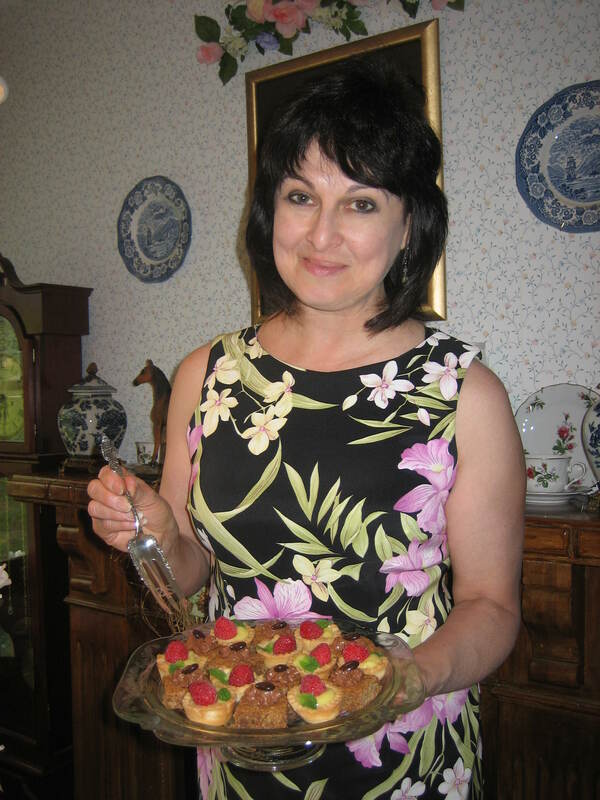 She made raspberry lemon tartletts. 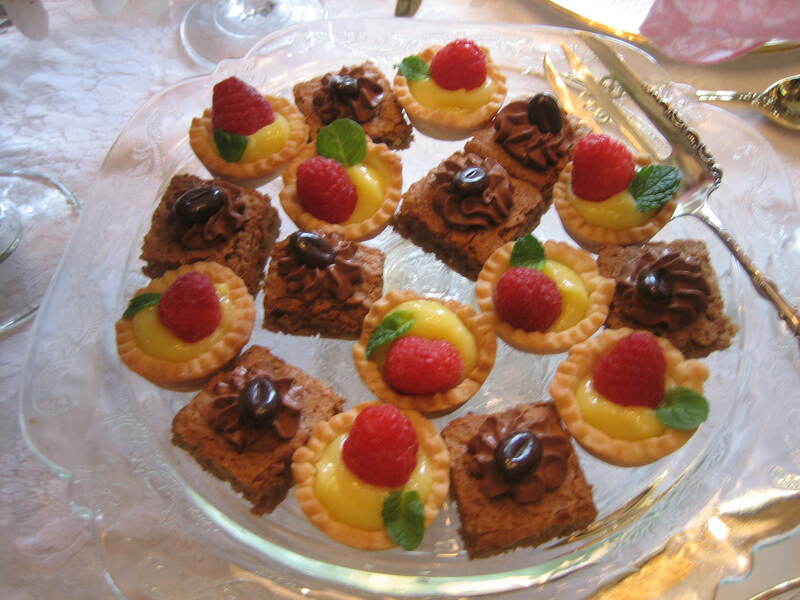 They consisted of a butter cookie shell filled with lemon curd and garnished with fresh bursting raspberries and mint. She also made walnut mocha squares. These squares are a Croatian recipe. They consist of brown sugar pastry topped with espresso infused mocha cream (YUM!) and garnished with chocolate beans. Evelyna tells us the delicious chocolate beans are hard to find, but she has a source – shops called “Earth Fare”. They carry the luscious little gems should you want to buy some for yourself. We ate. We drank. (tea) We chatted. Though all of us are busy, it is so very nice, and quite civilized, to pause now and then taking time for tea – taking time to appreciate nature – taking time to foster friendship. Two hours of this repast and off we went… refreshed! 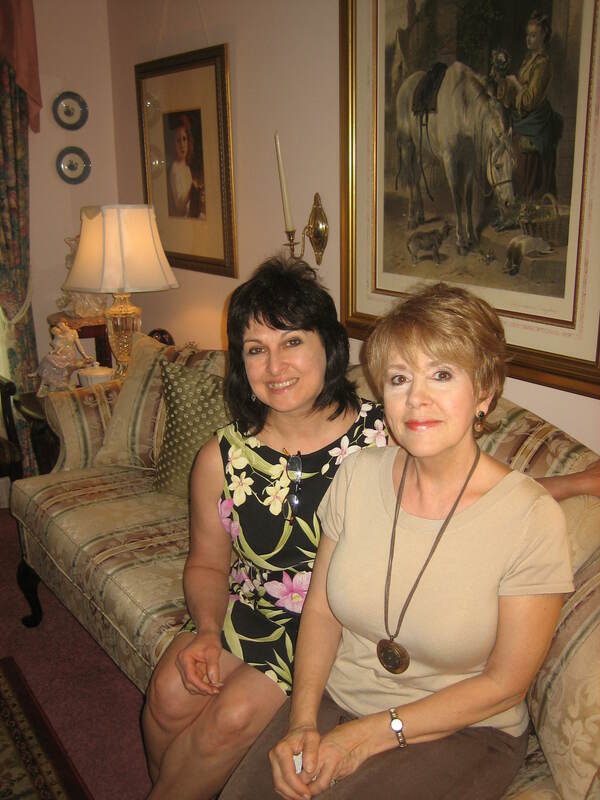 We returned to our lives with renewed contentment and the warm fuzzy glow that only beauty and friendship can provide. Take Time! Take Tea! Take Joy! Oh what a fun and relaxing time!! The food looked so delicious and the table was beautiful. I could almost smell the lovely apple blossoms. Yes, it was relaxing and Andy did a good job. Not many guys would bother having a tea. Not many gals bother inviting others for tea. You got to see Evelyna too. I hope she writes you soon. I hope she writes too but I will be surprised if she does. Sounds like she is just too busy..